Parrot is one of the most fascinating avian (bird) species found on earth. In scientific terms it is also called as PSITTACINES. Almost all the subspecies of parrots are vividly multi-colored, making them very attractive to look at. Though Pesquet’s parrot (colored black and red only) and African grey parrot (grey with slightly red tail) being exceptions to this vividness. A strong curved beak mostly red in color, strikingly colorful feathers, strong legs having four toes, two pointing forward and the other two to the backward with an erect posture are some of the characteristic features of parrots. Though, they vary in sizes, in terms of length, throughout their bird order. Hyacinth Macaw, found in the continent of South America, is the world’s largest parrot of about 100 centimeter length, while Kakapo of the New Zealand (an endangered species) being the heaviest one, weighing up to 3 kgs. Pigmy parrot, found in Papua New Guinea is smallest of all the parrot species, similar to the size of an adult human finger. There are more than 300 species of parrots found worldwide, most famous of them being macaws, parakeets, lorikeets, lovebirds, cockatiels, cockatoos, kakapos, African Grey parrot etc. Parrots are among the most intelligent of all the bird species, mainly because of their fascinating ability to mimic the sounds they hear, to near perfection. Besides, they have a long life spanning more than 60 years on an average. WHAT DO THEY EAT— they feed mostly on tiny insects, fruits, seeds and nuts etc. Their curved and strong beak helps those holding round & hard slippery nuts and seeds, which they love to eat most. Although, parrots are found all over the world, maximum of their population is found in the tropical regions, that too in the rainforests of southern hemisphere mostly. Because of warm and humid climate, wide variety of parrot species is found across the Indian subcontinent also. They usually live in dense forests in warm climatic areas but, can also make semi-arid regions as their habitat. Even some species of them like, keas, thick-billed and maroon-fronted parrots lives in snowy alpine forests. They generally live in the hollows of trees, but can also make mound or other such spaces as their home. Parrots also, like humans, are very social being and love to live in large groups called flocks, which may consists up to 1,000 birds at a time. This provides them with security against predatory birds besides giving them an environment of harmony with their fellow beings to live in. Parrots also lay eggs, like most other bird species. Their young ones, when they hatch, have only a thin layer of down feathers on their back. Their pin feathers (underdeveloped adult feathers) start to appear only after they grow three weeks old. The mother stays with the offspring to look after them, while father goes out to fetch them food. Within a month or two, these young ones grow up to fly off on their own. Parrots can simply be called as loyal towards their partners like swan, as they are monogamous. They woo their mates usually with attractive feather & tail displays and musical sounds. The beauty, intelligence and highly socializing nature of this wonderful creature have captivated human imaginations since a long ago, across the cultures. There are many myths, legends, literary writings, and artistic works and so on, associated with parrots. Like, in the South American and Mayan civilizations parrots and macaws used to be considered as a spiritual connection between the mortal & immortal world, besides symbolizing their feathers for the rainbow. ‘Kyash Kachina’ used to be worshipped as a parrot god in Native American cultures. In Indian mythology also, parrots have been a recurring theme often associated with ‘Kamdev’, the god of love, who is often depicted as riding a parrot. Many goddesses worshipped in southern India are also depicted as holding a parrot in their hand or simply accompanying them. There is a very famous legend, ‘Yoruba legend’, associated with the African Grey parrot; besides, parrot has also been part of various Buddhist and English folklores. Since parrots are very fabulous to look at and, at the same time are intelligent also in the sense that they can copycat the sounds/voices of the humans and other animals to the edge of perfection, they naturally attracts humans towards them. By virtue of their socializing behavior they easily mingle and make friends with us. Because of their vivid color scheme and mimicking capability we tend to keep them with us for a long and therefore, cage them. Besides, they are very smart pets, and often help their owner in earning money, by way of assisting them to do some prediction, or some kind of mimicry activities. Parrots are also widely employed in circuses to entertain the people by undertaking various types of funny and daring acts. But, since they are high- maintenance pets, in return they also require enough attention, affection, cuddling, exercise and patience, (as they are known to be very uttering with the sounds of screams, screeches etc. when they are very happy/bored) from their owner. 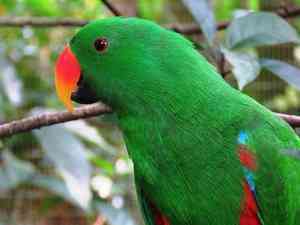 Almost one-fourth of the world’s parrots are on the verge of extinction. Population of this wonderful species is fast declining, owing to deforestation causing loss to their natural habitat. Besides, parrots have few natural predators in the wild like, monkeys, snakes and some other large predatory birds, but they tend to feed on the eggs of the bird, rather than the bird itself, causing end to the whole new generation of the bird. Moreover, since they are among most popular bird species, they fall prey to the widespread illegal trapping & trade in exotic pet species. CONVENTION ON INTERNATIONAL TRADE IN ENDANGERED SPECIES (CITES),1975 which is an international agreement among the national governments seeks to ban illegal trade in endangered wildlife species ( of both, flora & fauna) to ensure their survival. Bird life International, an international NGO with great repute, is also striving to conserve this very beautiful creature with their various protection and conservation programs, running worldwide. Every creature on earth has evolved and exists for a purpose, which it has to serve in maintaining ecological balance. We humans are also a part of this, and needs to live in harmony with every other creature, especially those who are small and vulnerable, parrots being one of them. It’s our responsibility to help them flourish and survive, whether in wild or in captivity.